Two 10” pipelines and a 16” header in the Middle East were to be re-purposed to provide water for emergency firefighting and would require de-oiling. The system could not be pigged conventionally, and would have proven much more expensive to use flushing alone. Aubin’s Pipeline Gel 33 was recommended due to the high viscosity of the oil to be removed – up to 140cSt at 50°C. This was initially a concern since the estimated temperature on the seabed was closer to 20°C. We requested a sample of the oil and tests showed it to be Newtonian in nature, so it would not shear thin when moved. Since the project was in the Middle East, we supplied the Pipeline Gel 33 in its concentrate form to aid with logistics. An Aubin representative accompanied the gel to aid, assist and supervise the blending procedure. The Pipeline Gel 33 was blended and injected onsite through the 12” flexible riser and into the 16” header. Pipeline Gel 33 took between 30 to 40 minutes to be pumped into the 12” flexible riser, while the XLB-10 cross-linker was spiked into the line through a T-piece. The cross-linked Pipeline Gel 33 was then pumped into the 16” header and through to the two 10” lines. Seawater was then used to drive the slug into the two 10” lines and finally to storage tanks onshore to recover as much oil as possible. The procedure was completed successfully without the requirement for a second stage flush. This had no impact on the integrity of the line, as the Pipeline Gel 33 is a water based product and has an excellent environmental profile. Aubin's Pipeline Gel 33 successfully de-oiled two 4.2km long 10" pipelines and a 1.5km long 16" header with one slug of gel on the first attempt. The pipeline system was successfully de-oiled and 344m³ of crude oil recovered. Pipeline Gel 33 provided improved displacement which reduced oil contaminating the flushing fluid. It also diminished water contaminating the oil, minimising process cost and maximising financial return. Pipeline Gel 33 successfully de-oiled two 4.2km long 10" pipelines and a 1.5kmlong 16" header with one slug of gel on the first treatment. Pipeline Gel 33 improved displacement which reduced oil contaminating the flushing fluid. 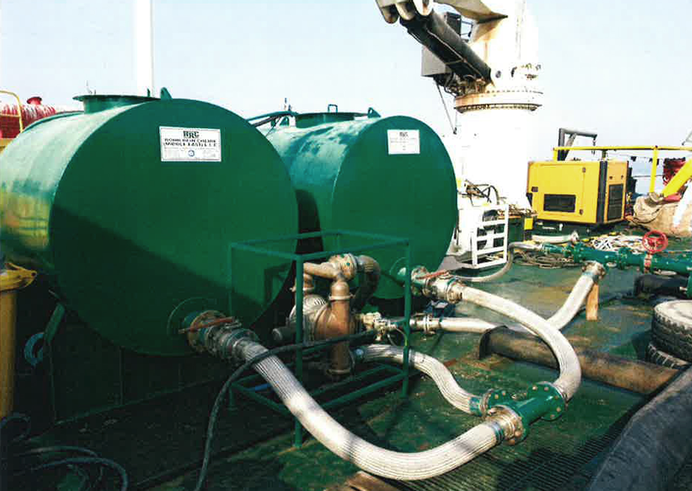 It also reduced water contaminating the oil, minimising process cost and maximising financial return. To find out more about Pipeline Gel 33 and our other Pipeline Gels, please click here.